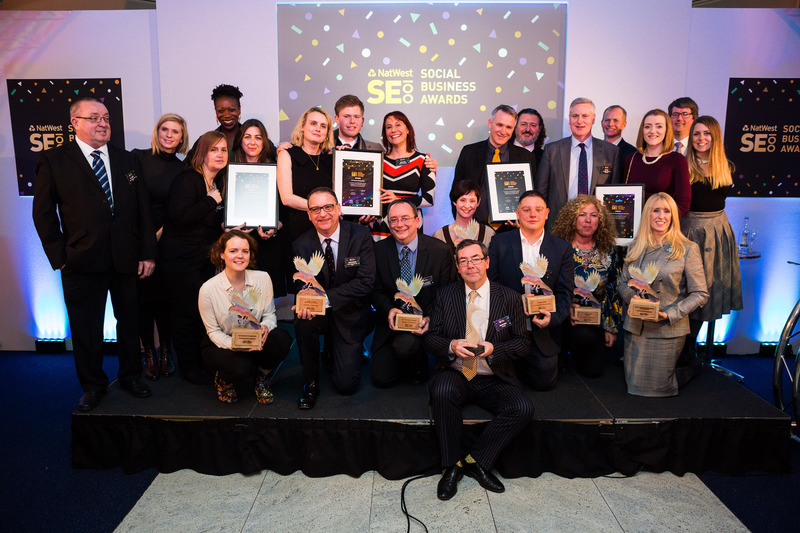 An extraordinary variety of social enterprises was recognised across six categories in the annual NatWest SE100 Social Business Awards in London last night. The eight winners were Manor House Development Trust (CEO Simon Donovan is pictured above hearing the announcement of their win), Change Please, Hertfordshire Independent Living Services, Belu, Philosophy Foundation, House of St Barnabas, Let's Do Business and Furniture Resource Centre. A list of winners and categories can be found below. This meant a disparate spectrum of offerings was celebrated, taking in social care, recycling and education but also leisure, retail and community services. Beneficiaries of the social enterprises also spanned a wide age range, with organisations counting schoolchildren and senior citizens amongst service users. The NatWest SE100 Awards, created by NatWest in partnership with Pioneers Post's sister company Matter&Co, recognises social enterprises which have demonstrated some of the best business practice within the sector and celebrates the growth, impact, ambition and resilience of social enterprises in the UK. Karen Lynch of bottled water producer Belu, who won the leadership award, said she thought she made a good leader because she looked forward to challenges: "I can’t resist wanting to solve your problem. I get excited about ideas, about solutions and about opportunities." Belu's profits go to Water Aid, a charity that works to give everyone access to clean water. Two of the awards were handed out by UK government representatives. Senior policy advisor at the Inclusive Economy Unit Colleen Ebbitt described social enterprises as "the cornerstone of our economy." She went on to make a link between the work of social enterprises and prime minister Theresa May's plans for the UK. "You no doubt heard our prime minister announce last week her intention to build a shared society," said Ebbitt. "This vision centres upon the values of citizenship, responsibility and fairness and that depends upon institutions that support and grow these values. "Therefore there's no better time than now to promote and celebrate the work of social enterprises, which are a core part of an economy that works for everyone." Rushinara Ali, Labour MP for Bethnal Green and Bow (pictured above), also presented an award. 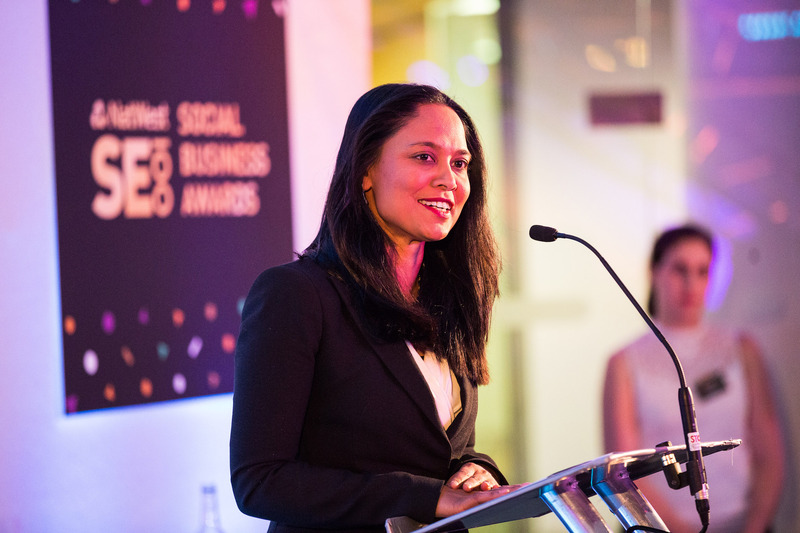 With a nod to the location of the awards ceremony at the NatWest/RBS conference centre in the City of London she told attendees: "I hope you continue to get the support from the business community because the economic value of what you’re contributing is phenomenal." The seven winners will receive a professionally produced winners film about their organisation for use across future PR and marketing collateral. They also receive an SE100 trophy created by social enterprise artists and a share of cash prizes totaling £6,000. The social entrepreneur addressing homelessness with coffee tells us why you might find him singing out of his car window round the streets of London and how Dismaland proved a happy experience for him. Social enterprises will be invited to attend free events that will provide knowledge and resources to help their venture grow and thrive and a host of other goodies are there for the taking.